Outside the soon-to-open Hollywood + Vine Metro Bike Hub. 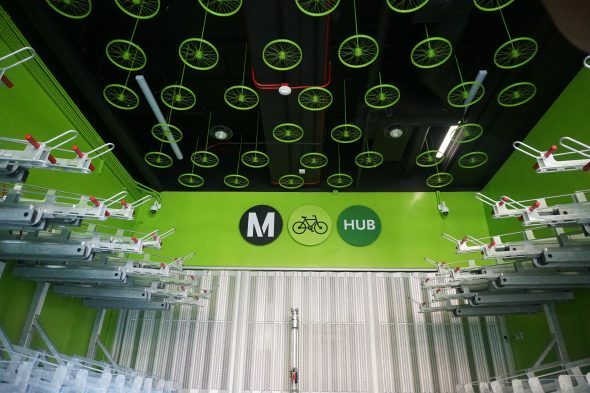 The first Metro Bike Hub opened at El Monte Station in 2015, and now we’re gearing up to open the second at Hollywood and Vine on Friday, May 19. The public is welcome to come to the opening ceremony that morning at 9 a.m. The Hollywood + Vine Metro Bike Hub has capacity for 64 bicycles and is located around the corner from the Red Line Hollywood/Vine Station. In anticipation of its opening, here’s a quick refresher of seven things you need to know about Metro Bike Hubs. Here’s a before and after of the Hollywood + Vine bike hub. What is a Metro Bike Hub? A Metro Bike Hub is a facility that offers bicyclists a safe and convenient place to park their bikes. The hub has controlled entry and 24/7 access for paid members. Attended hours vary by location and offer repair services and bike rentals. There’s a retail section for bike lights, bike locks and many other bike accessories. Metro Bike Hubs also provide free clinics such as Flat Tire Repair and Bicycle Commuting 101. Why should I use a Metro Bike Hub? When you park your bike at a bike hub, you’ll know that it is secure. The bike hub has CCTV coverage and a security alarm. Supporting amenities catering to bike commuters make it a one-stop shop for your bike transit needs. There is currently one Metro Bike Hub located at the front of El Monte Station. The second will be opening in a few weeks at Hollywood and Vine. How do I gain access to a hub? Inside the new Hollywood + Vine bike hub. Yes! Metro recently broke ground on the Union Station bike hub. It’s set to open later this year, and another is set to open in Culver City next year. Metro Board Member Ara Najarian and Metro DCEO Stephanie Wiggins join bicycle advocates to celebrate the groundbreaking of the Union Station Metro Bike Hub. Got more questions about bike hubs? Comment below or tweet us @metrolosangeles! OK, where’s the Senior discount? Yep, I already have a Senior TAP card, which is something you plan years ahead for. There’s absolutely nothing about this from BikeHub, the operators, on the sign up page, nor their website. I’d like to just use the TAP card, which has a picture and I had to send in ID to Metro. There aren’t gonna be many senior type using this, how about you make it easy? I bike everywhere. Discounts given for Seniors (62+), Disabled, Medicare and Students K-12 with valid identification. Online registrations will charged the Standard Cost, and refunds will be given in-store during staffed hours only. Hi Anna. My wife and I have been numbers 1 and 2 on the wait list for a locker at this station since around 2007. We’re out of town until the 20th, so I can’t enroll us online (as I don’t have a photo of my bike with me). Is there anyway you or someone else could help me out? If you mean registering for the bike hub, I would recommend calling staff at 888.659.2291 or emailing metro@bikehub.com. For bike locker assistance, please call 213-922-2660 or email bikelocker@metro.net. This way you’ll be able to directly reach the people who are managing the lockers and bike hub. Hope this helps! I can not understand why anyone would want to drive a car in LA (or anywhere for that matter) and not ride a bicycle. The health, environmental and financial benefits are real, measurable and spectacular. Effort needs to be put in presenting this vital information to the masses. We need to change the cultural mindset, and the grossly expanded waistlines and all the grief that goes with it! I had a coworker who would bike into work. It sounded like a great idea till you have to spend 8 hours seated next to a sweaty smelly person. I also registered and couldn’t find the senior pricing. So I paid $5 for a 7 day pass. What does a 7 day pass mean? I can only use the pass in a 7 day period? Or I can use it 7 times? Can I come and go several times in one day and that is counted as one day? Can I get a refund for the standard pricing and how is the senior pricing put on to the pass? Too many questions. I agree with the other poster that you should be able to use your Senior TAP card instead. Having two cards is not a good idea. There are absolutely still plans to open a bike hub at NoHo. I don’t have a firm opening date but I’ll check the status.